Select a project for more details. QP – Todd McCracken, Manager-Mining, WSP Canada Inc. has reviewed the contents for accuracy and has approved this information on behalf of Champion Bear. 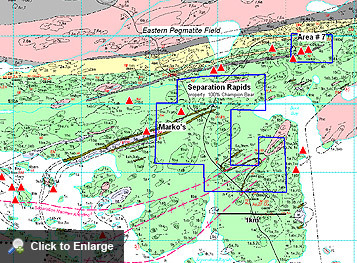 The Separation Rapids Tantalum property lies 55 km north of Kenora in northwest Ontario. The property occurs within the eastern portion of the Separation Rapids pegmatite field which is considered the eastern extension of the Cat Lake - Winnipeg River pegmatite field host of the Tanco Mine in Manitoba. 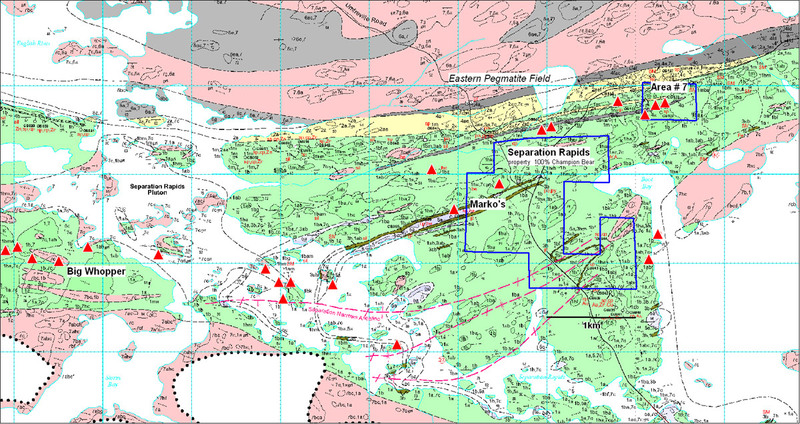 Champion Bear's properties occur within the 0.8 x 5 km area forming the eastern pegmatite subgroup located 5 km east of the Big Whopper deposit. Website DisclaimerCopyright 2019 Champion Bear Resources Ltd.